Lynne Martin’s new memoir, Home Sweet Anywhere, offers a roadmap plus a hefty dose of inspiration for the late life traveler. Leave a comment below to win a free copy of the book. Congratulations to Sherry Stephens, the winner of the giveaway! The book is on its way to you. It’s gutsy for college students to leave their “stuff” behind, say goodbye to friends and family, and hit the road to start a new beginning. But it’s even more rare when people have the moxie to do it in late life after they have reached 60 or 70 years of age. 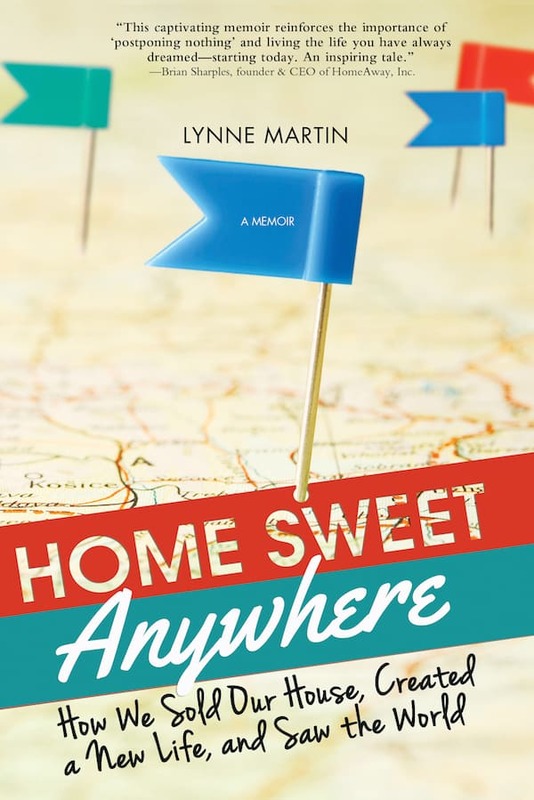 The spirit and spark that led Lynne Martin to pursue this unconventional approach to retirement with her husband Tim is the basis for Martin’s captivating, soon-to-be released book, Home Sweet Anywhere, How We Sold Our House, Created a New Life and Saw The World (Sourcebooks, 2014). “Life is too short and too sweet not to savor it the way you want,” says Lynne in the trailer for the book. So the Martins decided to find a way to realize their dream of late life travel. After they did the math, the couple figured out it wouldn’t cost them much more than living in their home in California and seized the opportunity to lay the necessary groundwork to live like locals in various cities, staying two or three months in each. Lynne’s memoir chronicles the couple’s experiences, and offers how-to advice and encouragement for any boomer or late-life traveler who is thinking of spending time abroad or who simply may want to rethink the status quo. To celebrate the publication of Home Sweet Anywhere on April 15th, 2014, the publisher has graciously agreed to give away a free copy of the book to one randomly chosen reader of MoreTimeToTravel.com. (Limited to U.S. or Canadian mailing addresses only). To be eligible for the drawing, simply leave a comment below (in the comment section of this post) with the name of the city where you might like to start your own trip if you had the opportunity to live like a local. All entries must be submitted by April 29, 2014; the winner will be announced here. I’d wanted to walk the hallowed halls of Le Cordon Bleu since a friend gave me the original Mastering the Art of French Cooking in 1965. After nearly half a century, it was finally happening. The school was located in our neighborhood. My sweet husband, recognizing its importance to me, helped me find it the day before just to be sure I had the right place and wouldn’t be a second late for my big moment. I set the alarm, even though it wasn’t necessary. I was like a six-year-old at Christmas and I could hardly wait to bound out of bed and race down the street. Soon, I sat in the small stadium theatre with a big mirror over the work counter, so those of us watching wouldn’t miss a thing. Assistants scurried to ready the mise en place for the chef, who entered to enthusiastic applause. He was informative and entertaining, particularly when he mimed a duck being force-fed to enlarge its liver. He shook his head in disbelief that California has outlawed such practices, thus depriving Californians from enjoying real paté! No comment from this Californian who lives with a paté addict. Chef prepared an entire meal from appetizer to dessert; after each production, we were treated to tastes. It felt like receiving communion in a culinary cathedral. Of course, I stopped at the tiny school store to purchase the best (and most expensive) apron I’ve ever owned. It wraps all the way around and has lots of pockets and a slot for my instant-read thermometer. I feel terribly grand and professional wearing it. My waiter’s wine opener, which travels wherever I go, sports the Cordon Bleu label and gives me a little charge every time I use it. I’m charged up several times a week – every time I open a bottle of wine! I floated home on a cloud of wellbeing. I had communed with the spirit of my favorite chef, learned some new world-class cooking techniques, and when I got to the apartment, my sweet indulgent mate was appropriately impressed with my tales. My brand-new apron got a workout that very night. Where would you like to live as a local? I cannot believe someone else is actually living my dream of the past three years. I am SO excited to read this book as I know it will help me make my dream a reality. The first place I would probably go for an extended period of time would be Paris – again. I have already stayed in the “perfect” apartment in Montmartre that I found via homeaway… and I would stay there again. I’d like to start living the dream in Madrid, Spain. I’ve been there before and loved it. I have American friends who live there as I expect to start with some place where I know people. I will be traveling solo and I think it’s important to not only prepare (the book will help with that) but also feel comfortable. Living the dream….this is exactly what I want to do. I’m torn whether my first stop will be Paris or Tuscany. Oh, the possibilities are endless!! Thanks for trailblazing, and writing this book which will no doubt be helpful to those who look forward to following in the Martin’s footsteps. I’ve been following the adventure since I stumbled on the first NYT article about Lynn/Tim. Would love to make that first step to a new lifestyle in Uzes (near Avigon) France, or nearly any of the other smaller towns in the south of France. Like Mike (comment above), I’ve been following Lynne since that first NYT article. We’d start our journey in Hydra, a favorite Geek island from past trips, and use the ferry system to visit more of the Greek islands. Opa! Lynn has been inspiring me for a couple years now. Her experiences and insights have changed the way I plan all my travel. We have truly enjoyed following Lynn on her journey writing the book – via facebook and online. What a joy it would be for us to start our trip in Paris – in the Spring of course! Thank you for this opportunity, can’t wait to read the book. Congrats Lynn! Congratulations on publishing your book! We would definitely start in London where we have friends who live there to help us get started. Then Paris, or better yet; Nice. Gosh! I can’t decide… Guess I’d better start reading on how to do it! I would love to start in Rome. When we visited on a vacation we were only there for a few days and it felt so rushed. We would love to stay for a month or 2. Or possibly Prague as a close second. I’ve always wanted to try living in an Amsterdam canal house. And you can get anywhere in Europe from Amsterdam. I was hooked on Lynne & Tim when I read the article in the NYT and have followed their journey ever since. My husband and I were even fortunate enough to share a lunch with them in 2013 in Berlin. Where would we spend our first month or two after selling all the trappings that bind us to a fixed address; well Paris of course. There we’d celebrate our newly won freedom and enjoy all of the many off the beaten path treasures that we’ve found during our many trips to Paris without the worry about what is happening at home. Home will be where we are any place in the world! I read about Lynn & Tom from an article in the NYT and have been hooked ever since. I haven’t decided exactly where I want to start but I think it will be somewhere in Ireland. It’s so ironic that I stumbled on this link in a friend’s Facebook feed today because I was just chatting yesterday about my dream to take my kids (current ages 6 and 10) to live and travel in Europe for a year. I’m racking my brain on how to make that happen, as we aren’t in the economic upper-crust by any means, so I’ve been looking for resources and stories from people who have done something similar. I can’t wait to read the book and hear all your stories! Our travels would begin somewhere in the British Isles, as I feel that would ease everyone into the experience with the least amount of culture shock, and then we’d travel the continent from there. As a writer, I hope to share our experiences as well, either via a book or blog. Congratulations on living such an amazing dream and inspiring others to do the same! Been following Lynn & Tim since I first read their story in WSJ in 2012. Been very inspired by their story and would like to start next phase of our life travelling the world in “a La Lynn Martin style”. I would definitely start with Simla, India. There are so many nice places to visit in this beautiful world that i would like to visit but need to plan the details over the next 3 years. Good Luck and Best Wishes! I’d start in our beloved Aix en Provence! The book sounds amazing and just might be the inspiration I need to do the same! There are so many places I’d like to live like a local but I think I would have to pick — and I know this is a little weird — Reykjavik, Iceland! I absolutely fell in love with Iceland and, according to NASA, this would be a good year to see the Northern Lights! I would love to be able to travel to another country and spend 2-3 months. I have traveled but only for 9-12 days at a time, which is not enough time to really get to know even a small area. This book sounds like the perfect way to plan and get more excited about that dream!! I have got to read this book. Something like this is something I’ve always dreamed about; and now, reaching retirement I wonder if my husband and I could do this. I would start out in San Miguel de Allende, Mexico. Correction: First name is Angeline with one I, sorry for the typo. I always thought I’d just want to see all of the USA to begin with, but with the possibilities of travelling the WORLD, I’d love to see Italy. We enjoy living with locals when we vacation, and never go to resorts. We love people and architecture and “going native”! Can’t wait to read the book and start my 6-year plans!!! I’ve just ordered the book & cannot wait to read in its entirety. Fascinated with the idea & have, out of necessity, done a lot of solo traveling & occasional tours. It would be lovely to have a relationship like the Martins, since it is special to share travel experiences, but I’ve found not absolutely necessary, always find interesting new people along the way. I would most likely start out in Mexico City since its always been magical for me since my first visit back in 1969 but haven’t ever been able to spend as much time as I’d like there. I would love to visit Rome for more than 27 hours at a time. As a recently retired airline pilot, I now have the time to really visit this wonderful city as well as the rest of this beautiful country. This sounds so exciting, my wife and I have been talking about doing this in the coming years. We love to go to Cape Town and I would like to go back to visit Algeria. I think that this book touches on practical aspects of the dream I’ve been trying to make a reality for several years. Maybe it’s the push I need to actually ACT on the dream! I would really like to spend several months in Turkey, exploring its cosmopolitan and rural aspects. I am approaching the age to start thinking about retirement, and by chance I saw their interview on one of the morning shows. Needless to say it sparked my interest, and made me start thinking how incredible it would be to travel and explore all the wonderful parts of the world. I would love to start in Croatia, and see all it has to offer. Count me in! I would start in London to ease our way into living abroad. My husband forwarded a link to an article about the Martins a few days ago and I’m so excited I can hardly think of anything else!! We are taking a 10-day trip to London and Paris in a few months and this will be my husband’s first time to France. I am praying he loves it. How to pick one place to start when we retire?? It would be a European capital for sure but will depend upon season. We have do much to discover so I will throw Germany out there since we haven’t been. It is amazing how many couples are living life like this. Really living. But, too few put their richer lifestyle to print like you have. Loved you segment on CBS Morning Show too. You two are added to my inspiration list. We are planning just this life for us & our kids & grandkids during our second-half, starting in the USVI on a big boat and we’ll see where the wind literally blows us. Years of research has also yielded Panama, Ecuador, Uruguay, and small towns of Spain & France as our journey’s short list of future homes & marinas. Thanks again for sharing your journey with those of us needing similar couple & family adventures. This looks like a terrific book and very inspiring. I would like to live in Luang Prabang, Laos for a month or two and settle into its rhythm. I would have to start my adventure somewhere in Central America – maybe Leon, Nicaragua.